You are currently browsing the tag archive for the ‘good food’ tag. We just returned from a spectacular weekend up in Co. Donegal with our friends Laura and Avril. Avril was gracious enough to invite the three of us up to her family’s home in Ballybofey for a night and then to the family’s vacation cottage in the wee village of Kilcar for the next two nights. We were treated to some home cooking from Avril’s lovely mom and enjoyed beautiful weather in Ballybofey. We took a nice long walk around the family land with Avril’s adorable dog Millie, and simply enjoyed being outside and not thinking about assignments for a couple hours. Me, Avril, and Jon enjoying some wine after our walk around Ballybofey. yes, you are seeing that right... me and a precious little lamb. While moving the sheep, two young lambs were moving a little slowly and got scooped up by John. He passed them off to the four of us for a couple of minutes of cuddling. Turns out the twin lambs were born just THREE HOURS earlier! Needless to say, I was in absolute heaven. Dream = come true. Laura and a little lamb. Note the umbilical cord! After much nuzzling and squealing, we returned the lambs to their (understandably upset) mama. While the lambs were definitely the highlight of our first day in Kilcar, we still had lots to do to finish out the day: Laura tried her hand at driving a tractor, we took a 2 hour walk and hung out on the seashore with the tide coming in, and devoured a lovely stew. Then it was out to experience Kilcar’s nightlife at the John Joe pub. We knew we’d be noticed as outsiders, but weren’t expecting to hear someone utter “Who are THEY?” approximately four seconds after we walked in the door. We enjoyed a couple pints and headed home to get some rest for day of fun number three. Day 3: Climbing the great Slieve League mountain. They’re known as the highest sea cliffs in Europe (although it seems that title is contested), and we started the hike around lunchtime. It was a gorgeous day and a perfect hike. We took our time, taking lots of photos of the incredible cliffs and the sapphire blue sea, and stopping to enjoy the view whenever we felt like resting a bit. Afterwards, we headed back to the house, exhausted but happy. County Donegal has officially won my heart. On this, our second Christmas away from home, we tried to celebrate as best we could. Last year, at least, Jon and I had my dad, uncle Cliff, and friend Matt with us to celebrate. So it was still a family affair. This year, though, we were on our own. Lucky for us, Shane (a Mitchell scholar who studies in Limerick) took a bus up to Galway on Thursday to join us in our celebration. 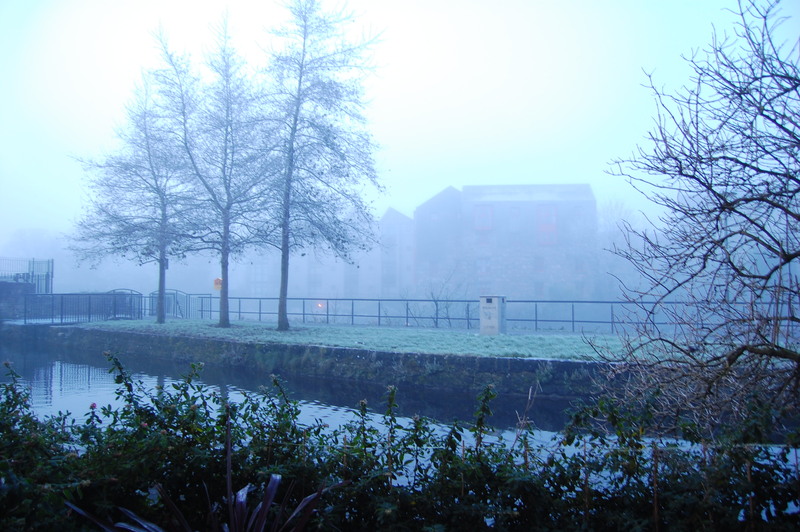 Just before Christmas, Ireland was hit with a little bit of snow – which is quite rare. We were hoping for a white Christmas, but instead we got a frosty and foggy Christmas eve. It was really a beautiful day. 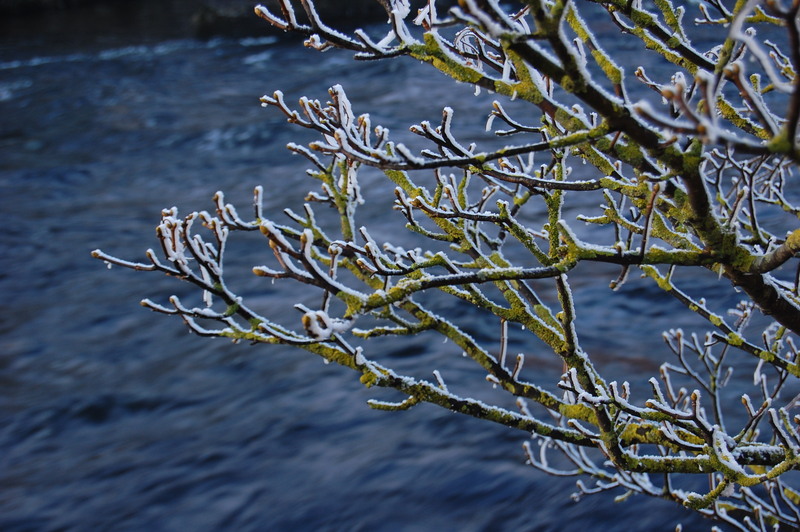 The ice/snow had frozen to the still-green leaves of plants and to barren tree branches, making the world around us feel a little more magical and Christmas-y. To make up for the fact that we were away from home, we attempted to do as many fun Christmas things as we could. On Christmas Eve night, we lit a fire in the fireplace, opened gifts from my mom (which is our tradition from that side of the family), and baked Christmas cookies. We headed over to a midnight church service at our local Anglican church (where Christopher Columbus is reported to have once prayed), and welcomed Christmas with candlelight and carols. 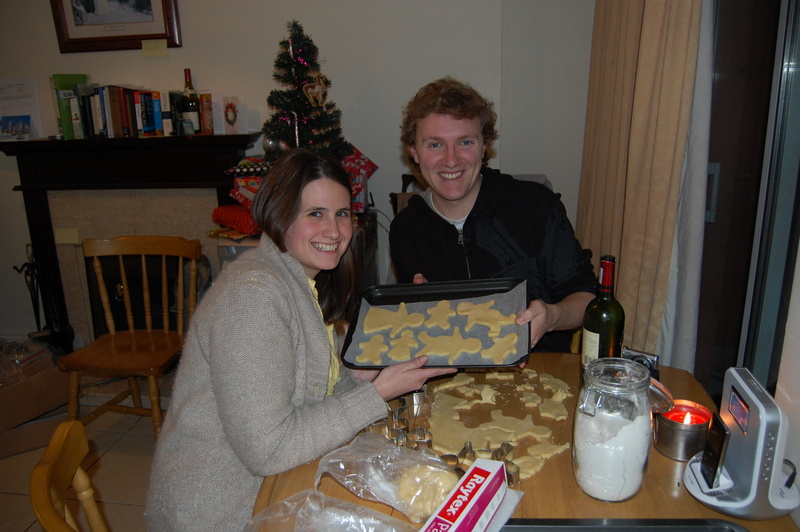 Shane and I bake cookies on Christmas Eve. On Christmas morning, we woke up and opened presents. Shane was wise and brought his gifts from his family to our place, and so we all had something to unwrap. We opened gifts in the tradition of my family: from youngest to oldest, one at a time. 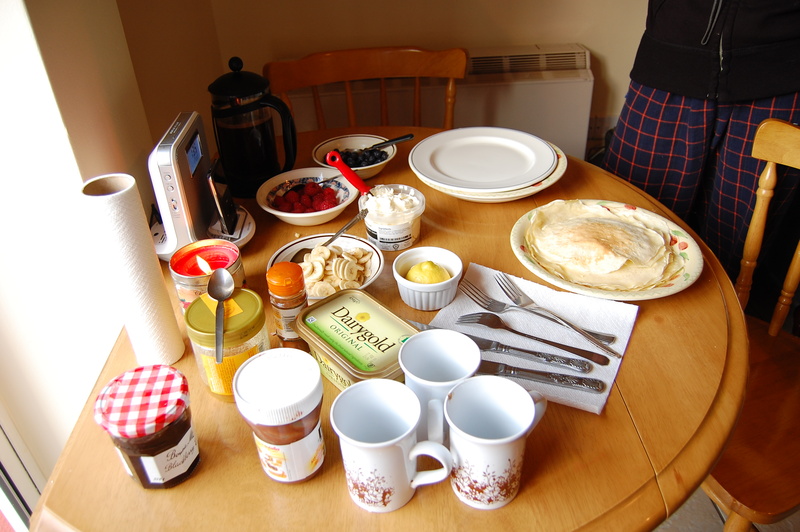 After the gifts, we made a big brunch of crepes with all the fixings: berries, bananas, nutella, lemon and sugar, and whipped cream. After recovering from the big meal, we went for a long walk along the ocean with Michael (another Mitchell scholar) and his family, who are visiting him. Christmas dinner was another big cooking adventure – red wine, prune, and thyme chicken, with garlic green beans, carrots, and mashed potatoes. Everything turned out well, despite the fact that most of it was a first-time attempt. Throughout both Christmas Eve and Christmas day, Shane, Jon, and I all made frequent use of Skype to be a part of our families’ Christmases far away. I opened my presents in front of the video camera so that mom could watch. Jon was a digital participant in his family’s gift unwrapping session as well. Between the three of us, we chatted with numerous uncles and aunts, grandparents, siblings, and nieces and nephews. What a relief it was to have the technology to help us feel a little closer to those we love and miss. This year’s Christmas was peaceful, full of sweets, and full of love, despite the fact that our families were an ocean away. As much as I look forward to spending Christmas with my family next year, I think I will always look back at this pleasant Christmas fondly. 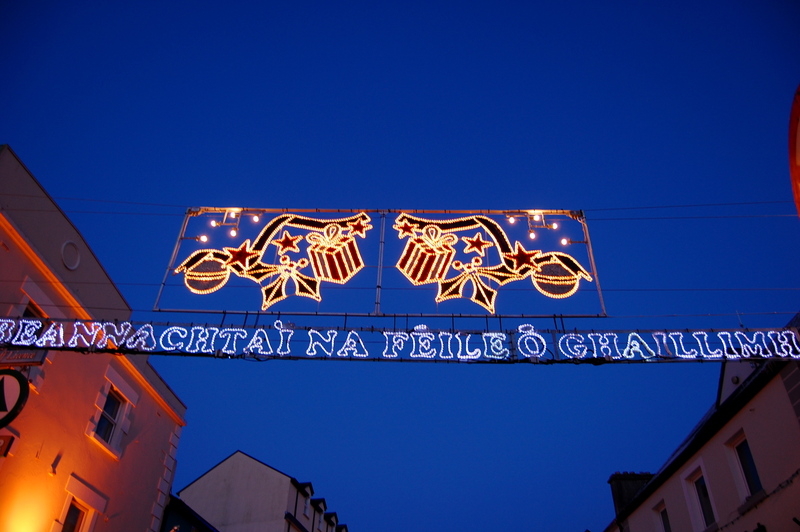 Nollaig shona duit (merry Christmas!) to you and yours this week. 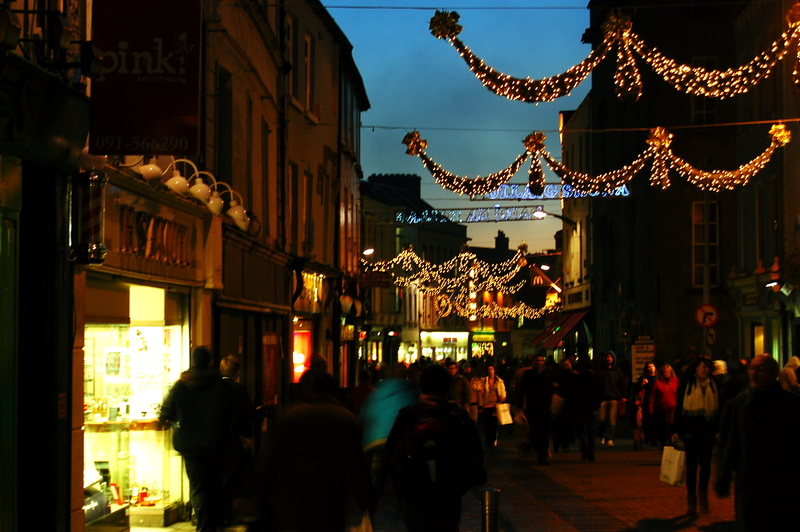 Last minute shopping on Shop Street in Galway. Me & Matt at the Mitchell Thanksgiving. Note I am eating a TOMATO! I, along with the two other Americans in my 11-person class, have spent the last couple weeks sharing the excitement and tradition of Thanksgiving with our Irish classmates. We’ve been retelling the Thanksgiving story (well, the version we learned as Kindergardeners, maybe not the most accurate version), describing our family traditions, explaining the importance of the central idea of giving thanks, and reminiscing over the food. The Irish girls were probably sick and tired of hearing about how great Thanksgiving is by the time it rolled around last week. But no one can say we didn’t try to share its wonderfulness! 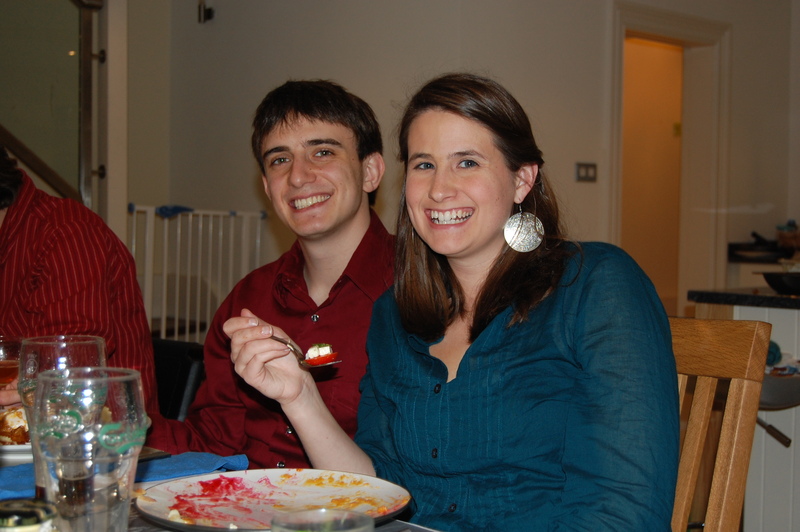 Jon and I love Thanksgiving so much, in fact, that we celebrated it three times last weekend! On Thanksgiving day, the other Mitchell Scholars and I had the chance to visit the Irish Dail (their Parliament), sit in on some proceedings, and meet a couple of Senators, including the wonderful David Norris. We also spent some time with staff members at the Department of Foreign Affairs, Anglo – Irish Division, talking about the current state of affairs in Northern Ireland. It was a great way to spend the day. That evening, me, Jon, Michael, Matt, and Neil shared a lovely Thanksgiving dinner at Neil’s friend Sophia’s house. 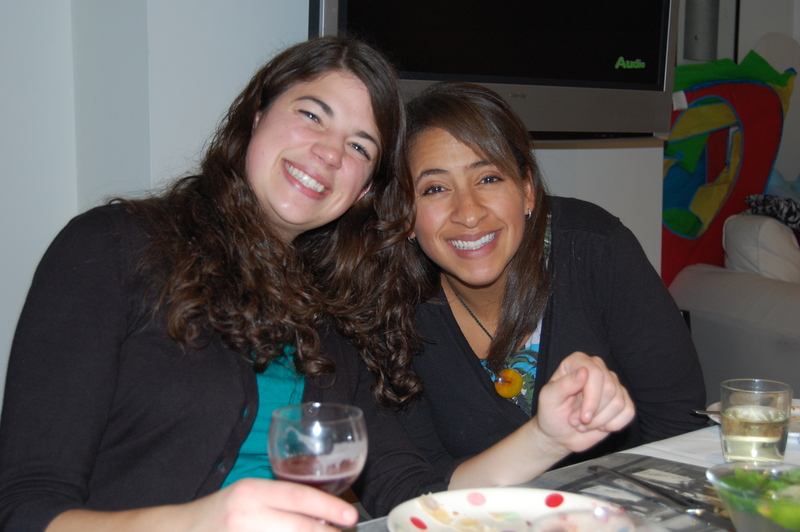 It was a casual night, filled with amazing food cooked lovingly by Americans missing home. We were lucky to have a couple Spanish, Irish, and English friends present for the big event. Friday evening was Thanksgiving #2, and a big highlight of the weekend. We were invited to Irish entrepreneur (and tv personality) Niall O’Farrell’s beautiful home in Dublin for a home cooked meal. He graciously welcomed us with delicious wine and a multi-course dinner. When the final plate was set on the table, for the cheese course, I wondered if I was going to make it out alive. But you know me, always a corner of my stomach reserved for cheese. I left feeling beyond stuffed. Saturday’s dinner was the official Mitchell celebration. Trina, the president of the US-Ireland Alliance, cooked a big ol’ turkey and the mashed potatoes, and we all brought something to share. One thing about the Mitchell Scholars: We really know our way around a kitchen! The Mitchells contributed amazing yams and sweet potatoes, lovely salads, beans, and of course, homebaked pie. Matt, an avid beer lover, even brought a variety of microbrews from his recent trip back to the States. Christina and Bre, the bakers of pies. If lack of wonderful food was a theme of living in Uganda last year, overeating may be the theme for this year in Ireland. It was a wonderful Thanksgiving weekend which reminded me of the many things I have to be thankful for: good friends, amazing opportunities, my lovely husband. And of course, good food. About two weeks ago, Jon and I had the chance to cross the border for a quick visit to Rwanda. We pretty much had to go, as my Ugandan visa was running out and I didn’t want to be on the wrong side of the law during my time here. We decided to fly to Kigali to save a little time and pain. After all, we’d just come back from Gulu on a pretty miserable 6 hour bus ride, and I for one was hating the idea of spending an additional 12-14 hours on a swerving, cramped bus through increasingly hilly terrain. I was not willing, at least not this time. We had a pleasant flight on a small airplane, passing over Lake Victoria and the “thousand hills” that make up the Rwandan landscape. When we arrived in Kigali, we easily made our way through immigration, hailed a taxi and made the 15 minute drive into the city. Jon and I had heard countless stories from friends about the major differences so apparent between Uganda and Rwanda. We had no idea how true these observations were. Unlike Kampala, we found Kigali to have well-paved roads, no trash on the ground, and a quiet yet lively pace. It felt a little weird, but it was nice. We checked into our charming little hotel and found ourselves exploring the small downtown area. Some of the things we discovered on our walk included the fact that Rwandan ATMs don’t accept American cards, most people speak Kinrwanda, French, AND English, and that there was a much higher number of mzungu tourists walking around than in Kampala. The next morning, after the most delightful breakfast of fruit and FRENCH BRIE CHEESE!, we headed over to visit the Genocide Memorial Museum. I had mentally prepared myself ahead of time for the sad stories of inhumanity and the ignorance of the western world. I was right to prepare myself, as each exhibit offered dozens of shameful stories. However, the museum also showcased stories of strength, resilience, and those who risked and gave their lives to save their neighbors. I found the whole thing to be beautifully done, to be educational, sad, and uplifting at the same time. Next on our journey was a trip to Gisenyi, which is a small town located on the shores of Lake Kivu in the northern part of the country. We mostly sat around, enjoying the gorgeous lake and the gardens of our hotel, and watching kingfishers dive over and over again. Unfortunately, the weather was mostly cloudy and rainy, so we didn’t get to enjoy the swimable beach (it’s hard to find non-pool places to swim that don’t have either crocodiles or a disease called Bilhazaria). After two nights at our little hotel, we made our way back to Kigali. The rides back and forth were truly stunning, as we drove up and down massive hills through picturesque towns. The memories of the genocide were never too far away; at many of the towns we drove through there were signs in Kinrwanda indicating genocide memorials on the sides of the road. The country continues to grieve. Rwanda is at an important place in its history right now, recovering from deep emotional trauma, poverty, and disease. The country has recently been acclaimed for its development and stability, but many are wondering if that might come at the price of democracy. Check out this article in a fairly recent Economist to learn more.